As an MCT I am sensible enough to realise that no matter how hard or how often I pray to the demonstration demon master to leave me alone, he will not do so. On Wednesday I ran through all of the demonstrations involved with the First Look Clinic for Windows Server 2012. Apart from a couple of known issues, all was well. So it was with great expectations that I arrived at Westminster University bright and early yesterday to deliver the said First Look Clinic to 60 odd invited delegates. Glossing over the glaring booboo I made about IPAM not supporting IPv6 (IT DOES – I meant to say DHCP Fail over does not but was lucky enough to realise and was able to correct this before the end.) the demonstration demons flew in, in force and proceeded to cripple two of the seven demonstrations (and two of the others were pre-recorded) so not a great hit rate. It has helped me though. In future I will be pre-recording ALL demonstrations to run as backups. A live demo is a great thing to see when it works well but when it doesn’t the deafening silence is hard to deal with! A resolution and it’s not even New Year. I will post links here so at least the delegates that missed out will be able to see what should have happened. Having taken the BETA exams back in July for 70-411 and 70-412 and been successful, I was left with the task of 70-410, Installing and Configuring Windows Server 2012 to gain the MCSA certification. Pleased to say that I was successful in that and in 70- 687 the Windows 7 Configuring exam too. Raring to go to teach Server 2012 and Windows 8, some seriously powerful and cool features in there. The list is far too long to mention. Watch this space for my top 5 features. T here are a large number of Certifications on my to do list. CCNA, MCSE Server and Desktop Infrastructure amongst them, the one thing that they all now have in common is the need to recertify after a specific period. Microsoft have dropped version numbers from all their ‘new’ certifications at MCSE level for this very reason. The MCSA’s keep their versioning. 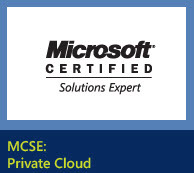 I was lucky enough to gain the MCSE Private Cloud certification this week and it promises to be the beginning of many hours spent nervously answering exam questions in search of all the new certifications that an MCT like myself needs to keep current, relevant and employed. I have had a great time over the last few weeks and months learning all about Server 2012 and Windows 8 and for one cant wait to start teaching them to hungry new delegates. I was asked by the marketing gurus at Firebrand Training to assist with their ‘little’ package of work to launch the course surrounding all these new products.So far this has taken a very long time and put me firmly out of my comfort zone! To say I was not comfortable in front of a camera is an understatement. The fruits of the toils are starting to come through though, several have been published and due to Google not liking duplicates, I can only post links here. I am ashamed to say that as an IT professional of over 20 years, I have only just felt the need to start providing a technical blog. My excuse, or reason is that I have only been formally teaching and training others for a few of those years! No not a very good excuse. This blog will be used to provide hints and tips and hopefully breaking news. Primarily in Windows Server and Windows Client topics. The first proper entry will be a guide to taking advantage of one of Windows Server 2012′s most usable new features. After that, the world is my oyster! I hope you enjoy reading the entries. Please do feedback what is good and bad, after all without feedback, how can we improve.